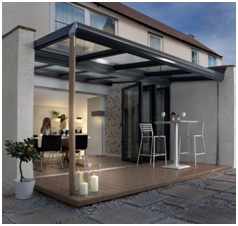 Offering a new take on the traditional atrium-style room, the Veranda collection is designed to complement any style and size of property. The innovative structure blurs the traditional boundaries of indoor and outdoor living, incorporating a large glass roof, space-saving bi-fold doors, as well as a sheltered extended overhang. This unique style of conservatory is a perfect entertaining space even when the sun is not shining, providing a sheltered retreat for relaxing. By utilising the innovative benefits of both Pilkington K Glass™ and Pilkgington Activ™ Blue, this new Veranda style means that the space can become much more than just a conservatory, in fact it becomes a useful glazed extension to a home. Using the right type of glazing will also have an impact on the use-ability of the room meaning it can be used all year round. It’s important to ensure that the inner pane of the insulating glass unit is a low emissivity glass such as Pilkington K Glass™. Thermal control is a key issue in terms of energy saving and is the perfect glazing solution for ensuring your glass extension retains as much heat as possible, particularly in winter months. The outer pane of the insulating glass unit should include solar control properties, in order to minimise solar heat gain, therefore helping to keep your extension cooler in the summer months. We have a number of products in our product range that help reduce solar transmittance, however, if you choose a roof design with at least a 15 degree slope to it, the perfect solution is Pilkington Activ™ Blue the world’s first self-cleaning glass with the added benefit of solar control properties. This clever glazing product has a unique dual action microscopic coating, which reacts with daylight to break down organic dirt. 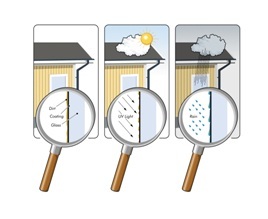 Then, when rainwater hits the glass it spreads evenly, running off in a sheet and taking the loosened dirt with it. It also dries quickly, reducing streaks. The frequency of manual cleaning is dramatically reduced. If it does not rain for an extended period all you need to do is give the glass an occasional hosing. For more information on Pilkington K Glass, Pilkington Activ™ Blue or any other of our glazing solutions please visit our official website.